Unfortunately, the dress you are looking for (Style: JT-652, Name: JT-652) is no longer available. Here's a long prom dress that's fit for a grand ball. This sleeveless formal gown features a bateau-neck bodice encrusted with sparkling jewels in a diamond pattern with a sheer-illusion v-back detail. 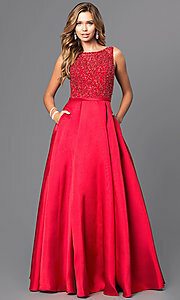 Trending box pleats at the natural waist on the satin skirt add fullness and style to this long regal prom dress. Stash your valuables in the side pockets of the elegant v-back dress and have a worry-free evening of glitz and glamor. An exquisite long dress for prom or military ball, this jeweled-bodice satin gown is sure to make a majestic entrance at prom or gala formal event.